My dad was a very creative guy, especially when it came to working with wood. He made the desk below when he was in High School, in a Woodshop class! He gave the desk to me when I was about 5 years old. This is the very same desk I use today. I'm sitting at it right now, typing! Back in 1998, I decided to update the desk with foam stamps and glaze, which created the colorful flowers & leaves. This desk is very special to me because my dad made it and I decorated it. Plus, my crayon marks spelling my name out at a young age are still visible inside the middle drawer! Dad is hand caning the seat for Steven's Wee Lassie Canoe, 2006. In September 2006 my family gathered at Secret Lake in Avon, CT (where we lived at the time) to celebrate my dad's craftsmanship and have fun. Our first Boat party! The invitations read: BYOB = Bring your own BOAT: a Dale Andrews Boat! ❤ My father made all of the boats below. 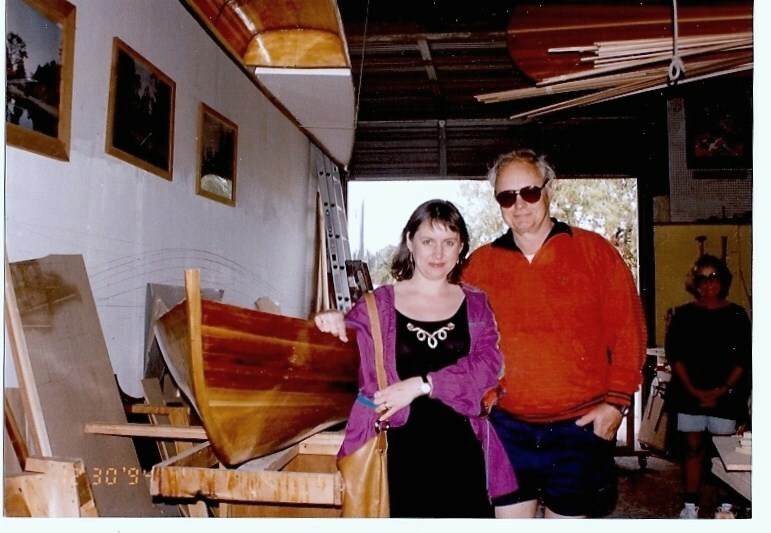 In 2006, my father made a single man canoe, a "Wee Lassie" especially for Steven. We lived in CT then. 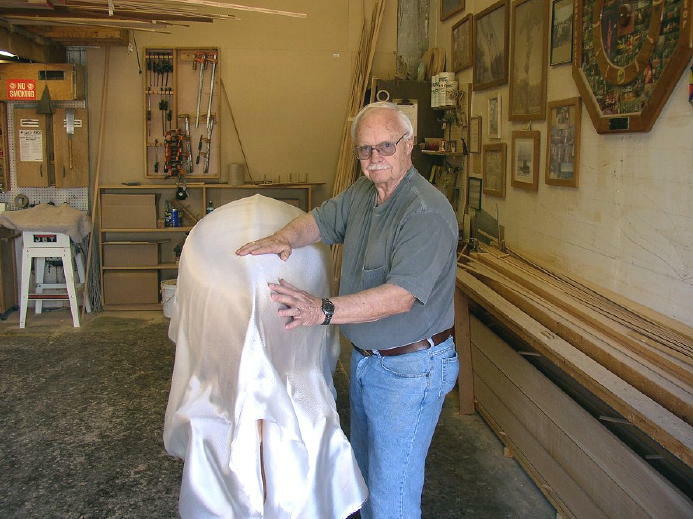 Dad sent a photo diary from Florida via email; his process of making Steve's 11-FT Wee Lassie Canoe. January 3rd, 2006, Dad writes us from Florida: "I was wondering if Steve would like his own single person Wee Lassie. If so, I will be pleased to make a gift of this one that I am currently working on. Let me know." Dad sent the photo below (#1) showing the beginnings of the boat being shaped on a form. The wood in the middle is the form. I wrote back on the same day: Oh Dad! Steven was SO excited to hear this question from you! I know he has already written you & said YES, but I wanted you to know, you "made his year" with this wonderful gift! It will be well used and loved. (#1.) Steve's Wee Lassie just getting started . . . (#2.) On January 6th, Dad sent us this photo. Cedar strip construction, formed on a mold. (#3.) January 14th -The boat is coming along slowly but surely. More below . . . .
(#4 & 5) January 16th, The email subject: One Day at a Time. After stripping, you take a block plane and smooth ridges and remove glue... another hour or 2 then a 36 rough sand followed by an 80 grit. Making progress. (#6.) January 23rd, Progress Report: Outside has been planed and sanded. One coat of epoxy applied and now ready for the fiberglass and 3 more coats of epoxy. (#7.) January 29th: after the 1st coat of epoxy is soaked in and dried, the fiberglass is put on with another coat of epoxy. You will see that the glass basically becomes translucent. Slideshow for the rest of the build . . . Steve’s single man canoe, by Dale Andrews! ❤This canoe is still Steven's favorite! He calls it his "Jeepster"
March, 2010 - We have moved to Florida! ❤ Dad and Steve refinished Windancer, the Melonseed sailboat dad built in 1995.